One full body massage and a long sleep later . . . Oh I am getting too old to do these shows for much longer! 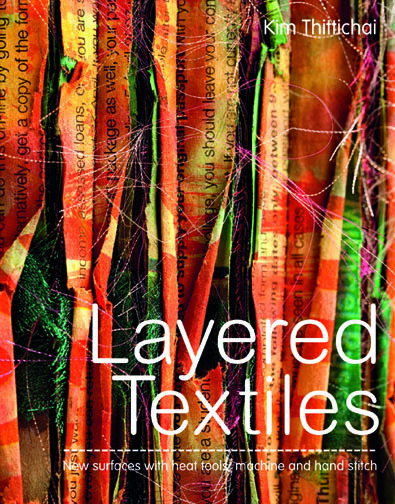 One of the wonderful things about Fashion, Embroidery & Stitch is that further education and higher education colleges are invited to have stands to show off the students fascinating work across the field of textiles. In these days of swingeing cuts and uncertainty in education it was good to see such positive energy, technical skill and fantastic ideas. The colleges also have the opportunity to show work in the amazing fashion shows put on by the indefatigable Brenda Killigrew of Inkberrow Design Centre. 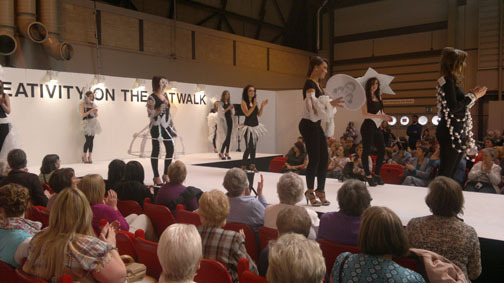 www.inkberrowdesigncentre.co.uk There were so many remarkable outfits to show this year that Brenda had to put on 2 different fashion shows which were rotated throughout the day. 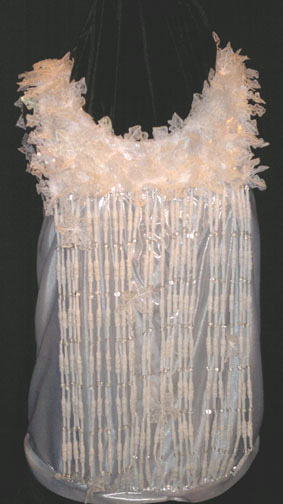 This was an amazing feat as Brenda and all the models and helpers had only hours to prepare. As some of you may know I occasionally work with Freudenberg Vilene in an unofficial capacity as a kind of ambassador for the brand. I love their products as they are just so versatile and always of a consistent quality, this has developed into me running the The Vilene Workshop at Fashion, Embroidery & Stitch and liaising with colleges to work with any new products. 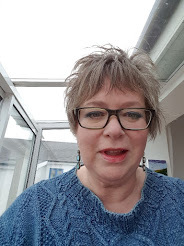 I asked Cherrilyn Tyler of Leicestershire Adult Learning Longslade to work with the Vilene Spunbond CS500 and CS500 Crash. 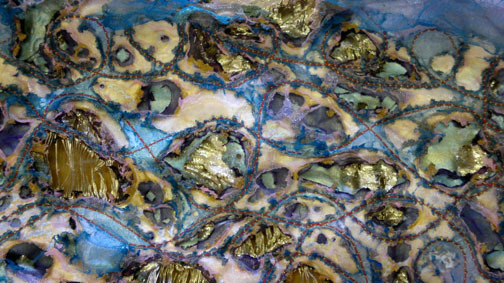 Cherrilyn is a brilliant textile artist and a great teacher. 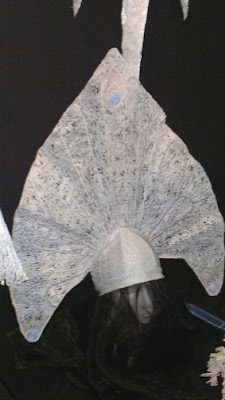 www.cherrilyn.com She came up with ideas based on Narnia, The Snow Queen and designs based on Erte. 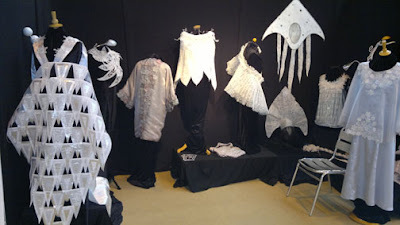 Cherilyn's students created so many exquisite pieces that they had enough to fill a stand at the show as well as provide the garments for the fashion show. 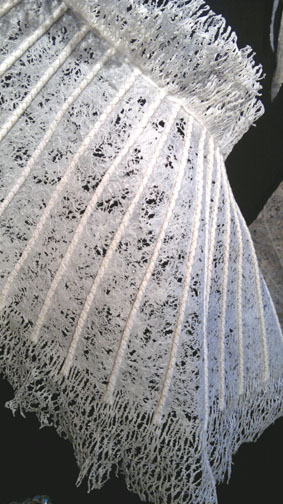 another wrap - just beautiful . . . 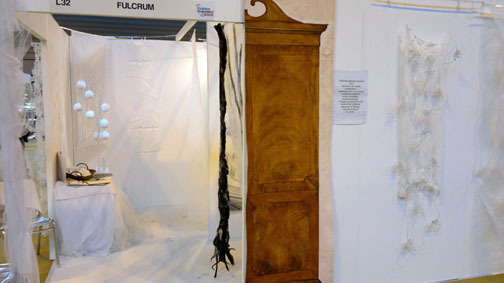 Some of the adult education students from Longslade have created a group named Fulcrum and they had a stand based on walking through the wardrobe into Narnia. 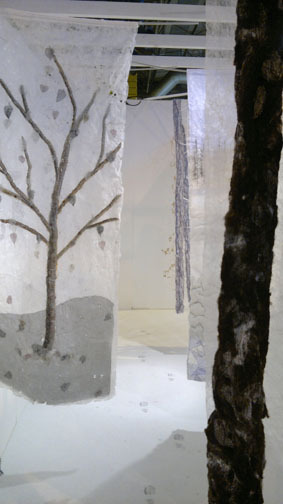 Most of the hanging panels were CS500 based with machine stitch and some were felted into. 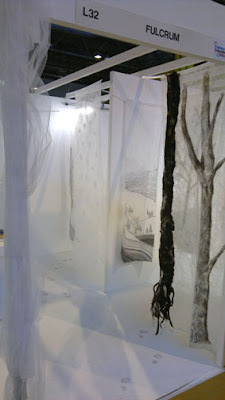 This charming exhibition was a joy to walk through, everyone seemed to be delighted by it. You followed the footsteps on the white carpet into an enchanted white, fairy life forest - fabulous! I should imagine that after such a busy time getting ready for and then setting up the college stands that Cherrilyn would be having a well earned rest, Ha! no, she is back at college working hard as usual. I think you will agree that Cherrilyn and her students did us all very proud indeed. I'm off to try on my white trousers to see if they fit ready for flying to Spain on the 10th - Yeehaa!!!! Hello Swansea and Manchester - was wonderful to see you. Well I am home now and exhausted but boy was it worth it. 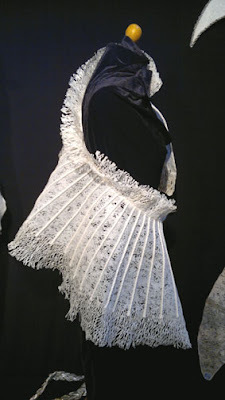 What an amazing show - Fashion, Embroidery and Stitch was even bigger and better than last year with some beautiful exhibitions, great textiles artists and tutors and some amazing work by college students. This will be a 2 part blog. I will cover the college work and fashion show tomorrow - this post is about friends . . .There will be plenty of other blogs giving you a detailed description of the show. 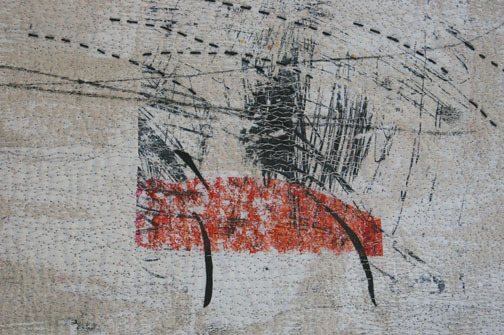 Wendy's current work involves working with old maps, beautiful, subtle and simple stunning. 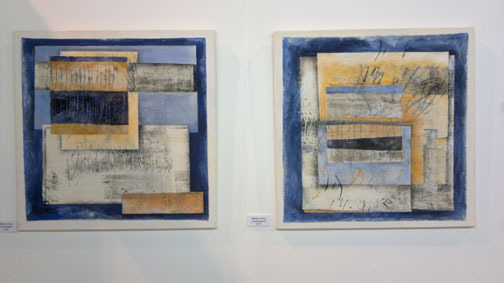 Wendy has 2 pieces of her work in my next book. 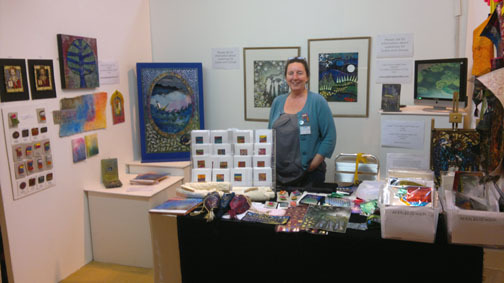 Wendy Dolan had stand a the show and when she wasn't teaching a workshop in the Bernina Workshop she could be seen working hard on her stand demonstrating her 'architecture' and 'landscape' packs. It is great to be seeing more of Wendy, we were at the Glasgow show together and will be at the Liverpool show in May. I can't wait to show her and her husband Rob the 'Gormleys' on Crosby beach. I was dead chuffed when Angie Hughes said she would be a part of the Vilene Workshop programme, I love her work, she is a FAB tutor and it is always great to catch up with her and see what she has been up to. There is also a permanent link to Angies excellent blog on the left. 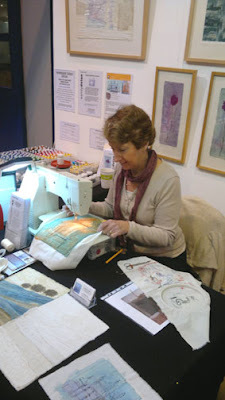 Sue Munday was exhibiting her work for the first time at Fashion, Embroidery & Stitch and was also delivering workshops on the Bernina Workshop stand. 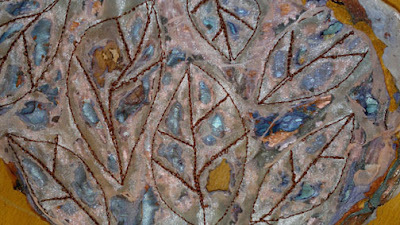 Sue is a specialist in computerised machine embroidery and is slowly winning me round to it. 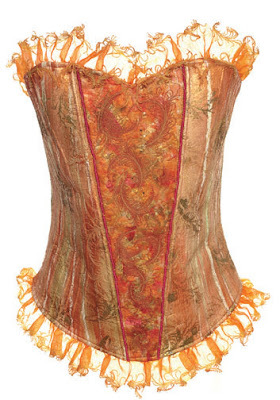 Her stunning corset is in my next book Layered Textiles. 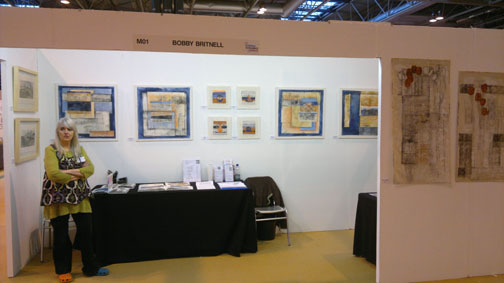 The great and VERY Wonderful Bobby Britnell was also exhibiting at the show along with her textile group Moor Threads. It was fantastic to be able to see Bobby every day, we rarely meet these days as we are both so busy. 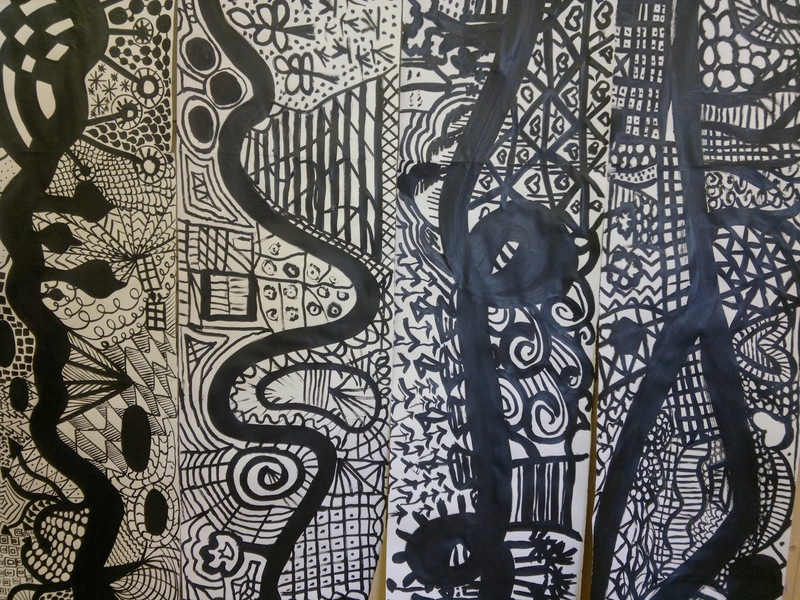 Bobby was teaching on The Vilene Workshop wowing her students with her printing and drawing on Bondaweb. 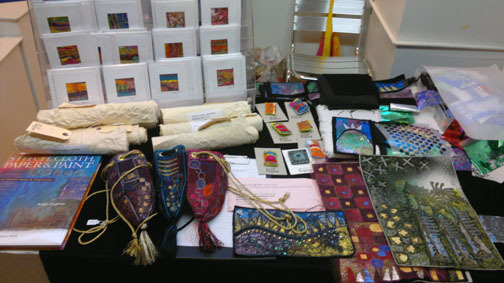 Bobby runs superb workshops at her studio and also team teaches with Ruth Issett. If you can get onto one of their workshops it will change your work forever - they make an amazing team. 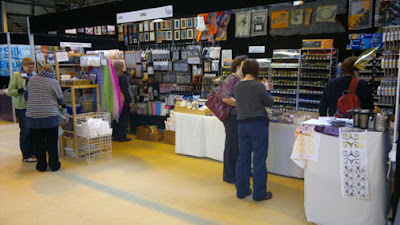 The show was a good opportunity to also catch up with all traders I deal with and work with. 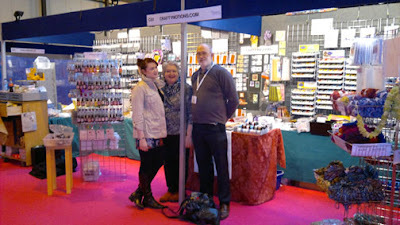 The Craftynotions team - Sarah has developed the new Colourful Thoughts paints that I use now. 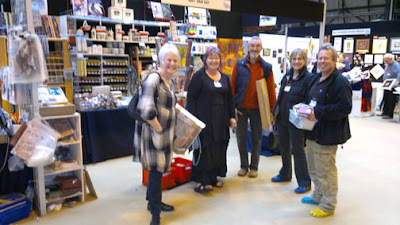 The Art Van Go team - Susan Chapman was demonstrating on the stand for Viv and Kevin, I had just posed the photo when Ruth and Chas Issett arrived - so good see them. I shall be teaching at Art Van Go at the end of April. It will be good to see more of them and to see how the garden has grown. The crazy Oliver Twist team - they are bonkers and such wonderful colours! The Ario team - I had just posed the photo with Karen and Fiona making faces at me - and some customers arrived - Huh!! I met Karen and Fiona many years ago at Excel when we were all starting out and we have been good friends ever since. I don't get to see the girls often, but it is FAB when I do. Well it's nearly here, the biggest show of the year for me - Fashion, Embroidery & Stitch/Sewing for Pleasure/Hobbycrafts. 3 shows in 1 - you will need 2 days to get around it! 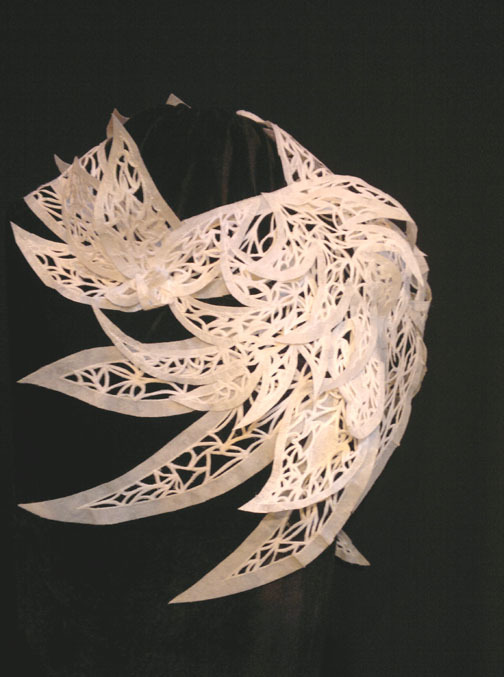 I will be part of Fashion, Embroidery & Stitch along with many fantastic textiles artists and tutors and some superb exhibitions. 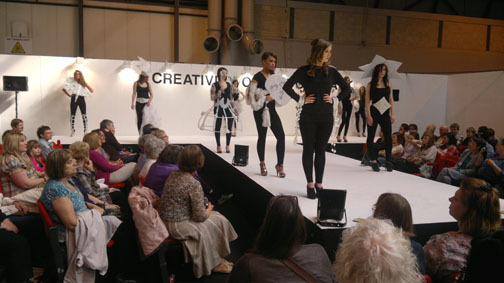 The fashion shows will be even more exciting this year with some stunning work from students across the country - you won't believe your eyes! I will be on stand L18 opposite FibreFusion and hope to be on my stand for most of the day demonstrating and showing you how to heat and colour metal with a heat gun and layer it up with Vilene Spunbond. 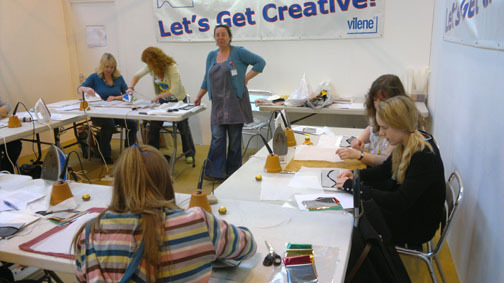 I am also organising the Vilene Workshop on stand Y02. I am very pleased to have some of the top textile tutors offering free short workshops everyday of the show. 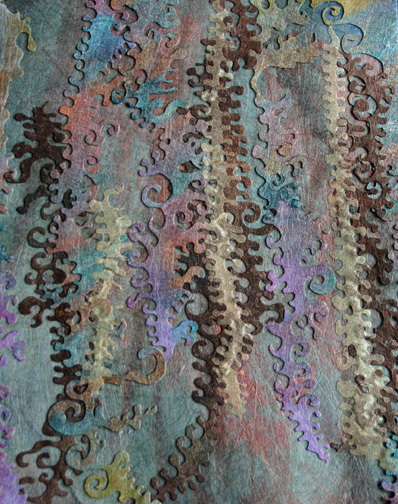 my new heat gun is powerful enough to colour metal- FANTASTIC! last year I ran out of Solufleece on the second day of the show, I hope to have enough for everyone this year! These workshops are free of charge, with places for a maximum of 10 participants at a time, booked on a first-come first-served basis, so please book your space with the relevant tutor on their stand to avoid disappointment. The Workshop areas are situated in Fashion, Embroidery & Stitch, end of aisle K.
Come and discover the versatility of Vilene Spunbond and Bondaweb, learn how to colour and distress these wonderful products. 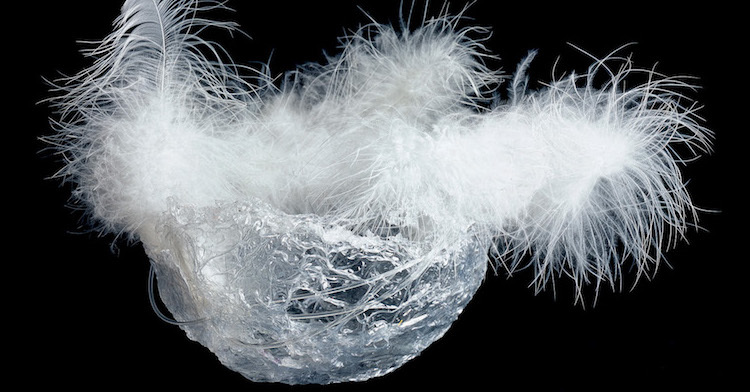 Experiment with different weights of Vilene Spunbond and heat tools to layer up a fascinating sample to take with you. The pages of these origami style folded pocket books are created from Vilene Spunbond CS700. 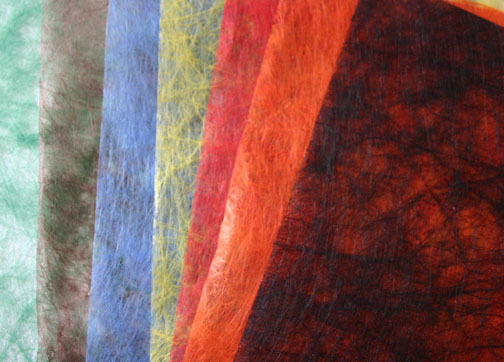 The books will hold three signatures with each one folded from a single sheet of the prepared fabric, creating a pocket on each side of the page – ideal for holding ATC’s or other small ephemera. 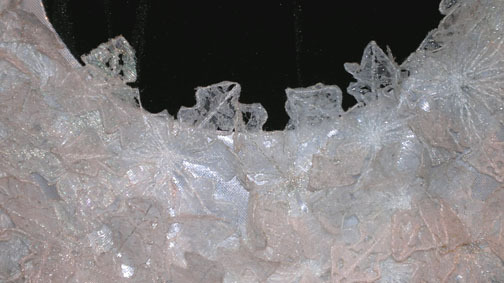 The outer cover is made from heavier Vilene Spunbond CS800, which can be further embellished with metal shim, threads and beads. Angie has developed this workshop to show you how to use transfoils with Bondaweb on black cotton velvet. Taking simple land or seascapes as a theme she will show you how to use this technique to make a twinkling surface for stitch. This workshop explores some of the methods that Bobby uses in her own work and focuses on ways of combining mixed media techniques using Bondaweb. Monoprinting will be used as an immediate way of generating linear marks onto the surface, which will then be embellished with bonded shapes and painted Bondaweb. 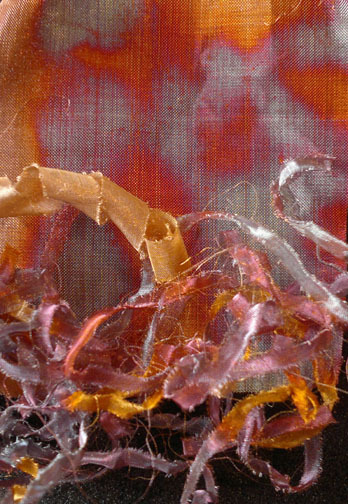 Evolon is one of the most recent of the spunbonded fabrics, which not only creates endless possibilities for the experimental textiles artist but also lends itself to traditional sewing and embroidery applications. This workshop focuses on applying colour using a resist technique with foam stamps & dye-based sprays. 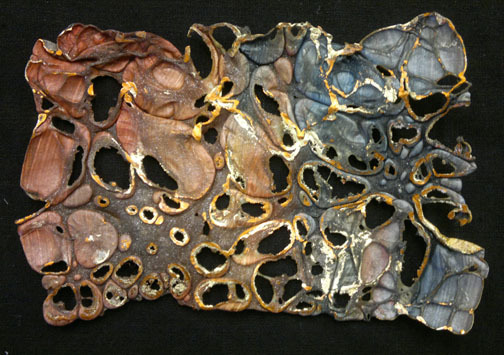 Additional surface texture can be created using a soldering iron. I think you can see we are going to have a very busy and very exciting show. 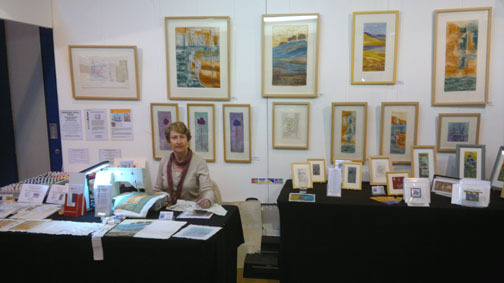 If you do come to the show, come and say Hello! 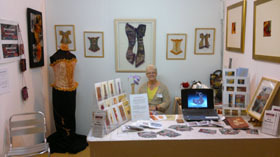 If I am not on my stand I will setting up The Vilene Workshop ready for the next tutor and wont be long. 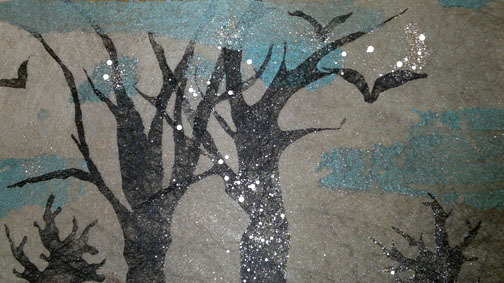 I'm now going to spend the day painting Bondweb ready for my workshops . . .
Friday 18th saw me driving along the A27 at an unearthly hour to deliver an 'On The Surface' workshop to the Txstyle 10 group. Txstyle 10 is a group of 10 ladies who all took their C & G qualification with Susan Chapman and have continued to meet and develop their work. 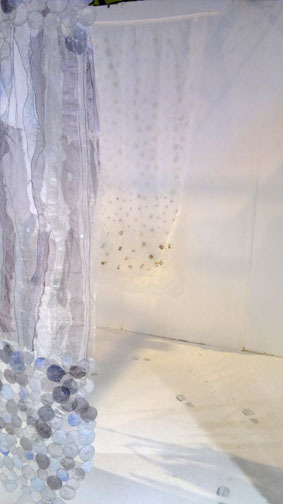 It made a great change for me to be teaching 'On The Surface' as opposed to 'Hot Textiles'. 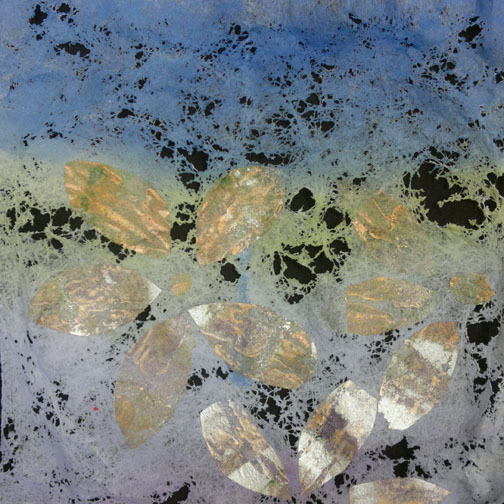 'On The Surface' is a workshop based around experimenting with Tyvek and painted and decorated Bondaweb. 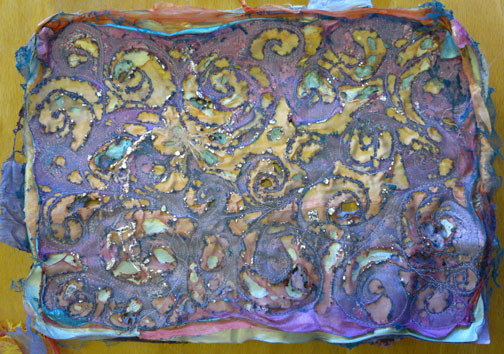 We added Vilene Spunbond to the workshop as the group hadn't had much of a chance to play with that yet. The group spent most of the morning painting the products as it is crucial to learn to paint the products with the correct paints and with the correct thickness of paint. The students learned my 'kiss, stroke and carress' process for texturing Tyvek with heat and the 'welly, wiggle and off' process for foiling the textured Tyvek. We had a relaxed but quite fast paced day with everyone producing some fab experiments. It is very important to 'play' with materials and products before you start to create finished projects. How else will you learn what they can do? 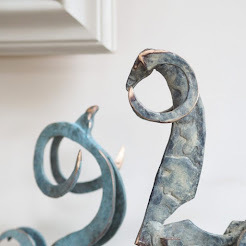 Of course, taking out time to do this can be an issue, but it is invaluable when you do. Give yourself permission to play!!!!!! 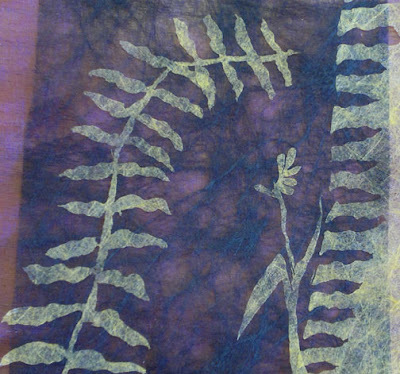 We did 'play' with painted Bondaweb and Vilene Spunbond but the Tyvek stole the day. A gorgeous sample exploring what you can apply to painted Bondaweb, glitter, artichoke seeds and gold foil slashes were added to create this wonderful 'firework' effect. Claire Muir was teaching there this week, I can't wait to catch up with her and see how it went, I think the weather was bit cold the first few days but got better as the week went on. The average day time temperature mid April should be around 20 degrees. Yeeha!!!!! There is a visit to the local market for inspiration, a trip to Murcia with tour (you get a chance to have a look at the amazing Cathedral), lots to see and do. 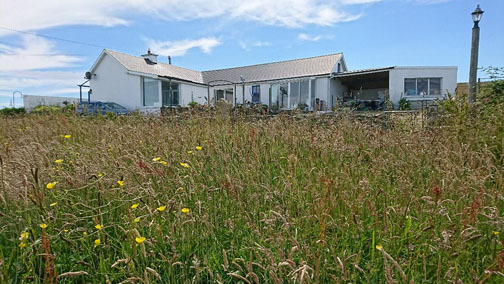 The courses/holidays have been developed to give you the best chance to enjoy the area but also get some work done. Jane Sadgrove beader extraordinaire is teaching the same week as me so if you have any beading friends they could do her course while you do mine. 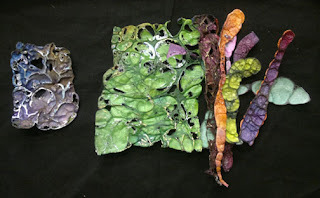 One of the great things about these courses is that Jane Bolsover is a part of Castanea and is present at all workshops to make sure things run smoothly and can sort out any health issues, food allergies and generally help with anything that may occur. She is indeed Superwoman! I am now going to rush about getting ready for my biggest show of the year. Fashion, Embroidery & Stitch at the NEC starting Thursday this week - AARGGHH!!!!! I will post another blog about that tomorrow . . . . . .
Wow! What an amazing group. 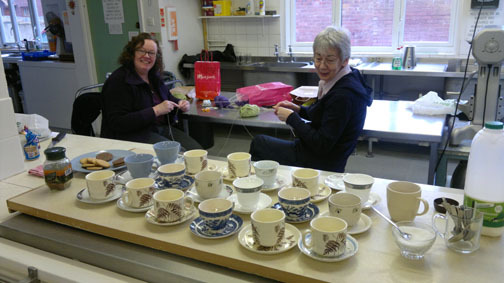 I was booked to deliver a lecture on the Saturday afternoon and a workshop on the Sunday in the local Darby & Joan Hall in Cottingham. The hall was packed on Saturday with a vibrant group of ladies of all ages. The lecture was well received and I was fascinated to see how the group was run. I am used to travelling around the country to Guilds and private groups and it is always interesting to see how things are organised - or not! This has got to be the most organised, friendly and possibly largest group I have encountered. 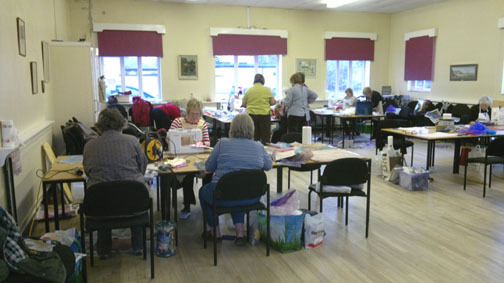 The group was started in 1982 by a C and G embroidery group with some of the original member still attending The group were about 30 strong and have grown to 136 members. The E.Y.E.S. 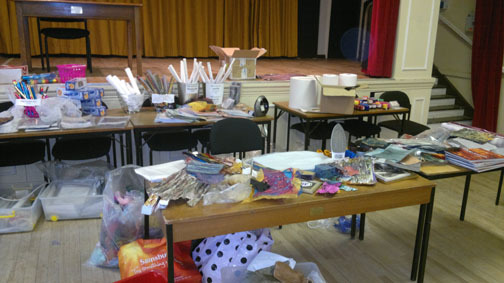 group also have an 'Eyelets' group for 5-10 year olds and a 'Highlights' group for teenagers. It was an absolute joy to meet everyone. 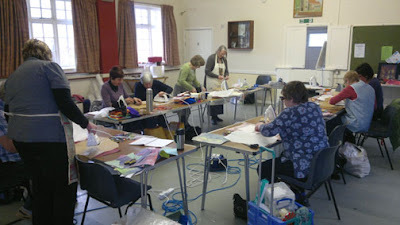 The workshop was Hot Textiles and we had a larger group than I would have liked as I to try to keep to a maximum of 15 when working with heat tools. We ended up with 17 but everyone was very well behaved and we managed to get through the day unscathed. On the way up to Yorkshire I dropped into Craftynotions www.craftynotion.com to collect some of Sarahs new Colourful Thoughts paints. 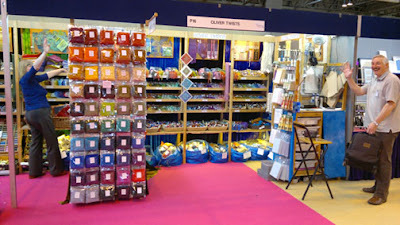 They are the BEST paints I have found for painting all my products and as I have to water them down most of the time they go a very long way. 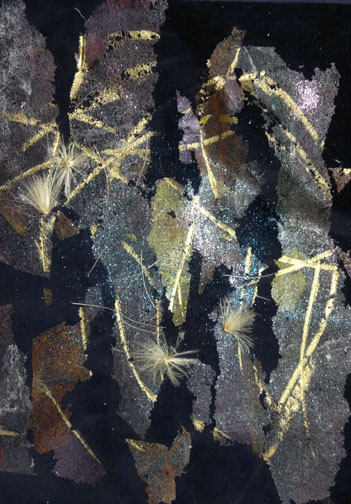 The paints are very metallic and this is not lost when the paints are watered down. We used the paints in the workshop and everyone was very impressed with the colours. The workshop went very well with the group producing some fabulous samples. I hope they enjoyed themselves as much as I did! On my way up to East Yorkshire I stayed with my good friends Sandra and Greg. Sandra always keeps an eye on my diary and offers to put me up when ever I am in the area. I am always very well looked after. 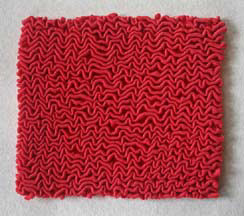 While I was there I commented that is comes to something when you spend more time cleaning your teeth than you do applying your make up in the mornings as I now have use those little pipe cleaner things and it takes ages. Greg then told me about his new water pick. It squirts a high power jet of water into the gaps in your teeth (if you can control it) and marched me off to the bathroom to demonstrate. Now any of you who know me will know I love any kind of gadget so I was very willing to have a go. It was hysterical, there was water EVERYWHERE, I was laughing so hard I couldn't control this clever gadget and managed to soak both myself and Greg. I think I will get one though, it does seem very efficient if you can control it! Have any of you got one? 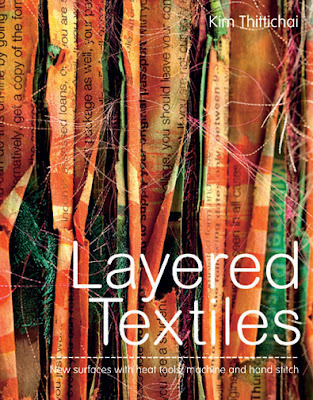 This is just a quick post as I have just returned from Yorkshire and will tell all tomorrow but just had to show you the cover of my next book - Layered Textiles - New surfaces with heat tools, machine and hand stitch. 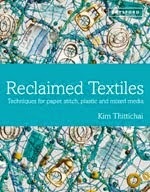 The book should be published by Anova/Batsford books mid August. The Heat Guns Have Arrived - Hurrah! Travelling South . . . !